Former army man Dennis Sarginson is using his skills to help veterans with sight loss improve their IT skills. Using computers and tablets has become an important part of everyday life - it’s something almost everyone does and it’s a vital part of our independence and when someone loses their sight, that is often the first thing that is lost. When ex-Army man Dennis Sarginson lost his sight, he found it difficult to adjust. With the help from Blind Veterans UK, Dennis has now regained his independence and confidence and has gone back to work, teaching other blind veterans IT skills at the charity’s centre in Sheffield. Dennis said: “When I lost my sight, I heard about Blind Veterans UK but didn’t want to accept help at first. After about a year, I contacted them for support and visited the centre in Brighton. I got involved with IT training and found I really enjoyed it, so I went back and did more training at the Sheffield centre. “The charity encouraged me to get some qualifications, and do a course with the RNIB in Loughborough. While I was doing that I did a placement at the Sheffield centre in the IT training department, and stayed on afterwards! 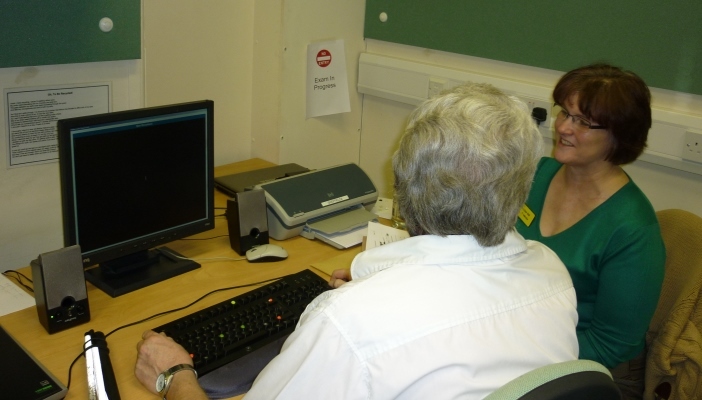 IT instructor Gaye Atkins has worked at Blind Veterans UK for 15 years, and has worked with hundreds of blind and vision impaired veterans, just like Dennis, providing training in how to use a computer and specialist software such as Guide and Supernova as well as helping them get online. “IT skills are so important in helping someone be independent, whether that’s about getting them back in to work, or being able to use email, Twitter or even Skype to keep in touch with family and friends. We teach everything from touch typing to providing ITQ exams, working with each individual to cater to their needs. There are tens of thousands of veterans now battling severe sight loss, just like Dennis, but they are not aware of the support available to them. If you work with, or know of, a blind Armed Forces or National Service veteran, refer them to Blind Veterans UK by calling: 0800 389 7979 or visit www.noonealone.org.uk.